The al-Shiskakli regime's appropriation of American political culture, exemplified in the above caricature, which accompanied the state-sponsored article "Luminous Pages from the Life of a Leader," was instrumental in creating and sustaining the dictator's leader cult. As recent events have demonstrated, one of the most significant phenomena of the Arab World’s modern history is the persistence and resilience of undemocratic government. Syria has enjoyed the dubious distinction of leadership in this respect, its experience foreshadowing and/or exemplifying that of its neighbors. The pattern was established in 1949, when Syria experienced three coups d’état that installed a succession of military rulers. All of these coups were planned and executed by Army Colonel Adib al-Shishakli, who today is largely forgotten in Syria, and remains an obscure figure to all but a narrow circle of historians and political scientists outside the country. This is a considerable oversight, for after seizing power on his own behalf in December 1949, al-Shishakli effectively ruled Syria for much of the next five years, during which he wrought long-term changes in Syria’s political culture and initiated a host of policies and practices subsequently adopted by Egypt’s Gamal Abdul Nasser, Syria’s Hafez al-Assad, Iraq’s Saddam Hussein, and other authoritarian rulers throughout the region. Al-Shishakli aggressively pursued an ambitious program of national development that aimed to transform Syria’s political economy, governmental structure, and social relations. The resulting populist, corporatist, and authoritarian institutions and practices provided a legacy of undemocratic precedents as well as the institutional framework for the Ba‘th Party and Hafez al-Assad’s implementation of yet more transformative measures in the 1960s and 1970s. More significantly, al-Shishakli’s efforts to reorder Syrian political life included the abolition of existing political parties, and their replacement with a Pan-Arabist mass-mobilization organization, the Harakat Tahrir al-‘Arabi (Arab Liberation Movement). Focused on his person, this organization, along with a vastly expanded system of state-supervised print and broadcast media, was instrumental to the articulation of an authoritarian, state-guided public culture that was unprecedented in the Arab world. The most distinctive feature of this new public culture was al-Shishakli’s cult of personality, an innovation that would have dire consequences for the future politics of Syria and the region. Although this experiment occurred three decades prior to the appearance of Hafez al-Assad’s personality cult, scholars have routinely characterized the latter as an unprecedented phenomenon in Syrian history. The scholarly consensus also presumes that the “leader cults” of post-WWII Marxist dictators—Stalin, Mao, Nicolae Ceaușescu, Enver Hoxha, and Kim Il-Sung—provided the only possible precursors for the elaborate leader cults of Hafez al-Assad and Saddam Hussein. In fact, al-Shishakli’s cult provided the most obvious model for Assad’s, which mimicked its predecessor in a number of significant ways. Furthermore, the genealogy of modern personality cults is more complex and varied than conventionally assumed. The personal histories and interests of al-Shishakli’s advisers and cult architects suggest a source of inspiration remote from the practices of Socialist regimes. All of the available evidence indicates that the cult was informed, at least in part, by the practices of American business and political culture. In keeping with the principles formulated by founding theorist of public relations Edward Bernays, al-Shishakli’s advisers used his expanded apparatus of propaganda and persuasion to identify, exaggerate, or invent threats, enemies, “lacks,” “absences,” or problematic social conditions. Then they presented the “remedies” for these ills; the protection provided by al-Shishakli’s leadership and his command of Syria’s expanded and valorized armed forces, police, and security services. Adib al-Shishakli was a veteran of the French Mandate-era gendamerie, the post-independence Syrian Armed Forces, and al-Jaysh al-Inqadh al-‘Arabi (The Arab Salvation Army), a multinational force created to combat Zionist paramilitaries in Palestine. Embittered by this last experience, al-Shishakli became convinced that the Arabs’ humiliating defeat was attributable to the indifference, incompetence, and corruption of the Arab states’ civilian politicians. This explains his role as the key actor in all five of Syria’s post-independence military coups. In 1949, al-Shishakli commanded the forces that overthrew Syria’s civilian government, the regime of General Husni al-Za‘im, and that of al-Za ‘im’s successor, General Sami al-Hinnawi. Al-Shishakli characterized this last intervention as a “correction” of al-Hinnawi’s posture favoring union with the British-allied Hashemite monarchy in Baghdad. Twenty-one years later, Hafez al-Assad would use the same term to describe his coup against his “excessively” Leftist comrades in the Military Committee of the Ba‘th Party. Upon assuming control of Syria’s government, al-Shishakli proposed a developmental program that encompassed the revision of Syria’s civil and criminal codes, restructuring the system of land tenure, reformulating relationships between capital and labor, the founding of a national bank, expanded access to all levels of education, universal conscription, women’s suffrage, a progressive tax code, the forced settlement of pastoralists, and a host of other measures designed to stimulate agricultural and industrial production, raise the living standards of peasants and workers, and increase state revenue. As many of these initiatives were inimical to the interests of Syria’s entrenched political and economic elites, they could not be realized through conventional modes of politics. Thus in November 1951, al-Shishakli overthrew the civilian figurehead government he had previously installed, dismissed its cabinet, dissolved parliament, banned most political parties, abolished the Supreme Court, suppressed influential newspapers, prohibited students, teachers, government employees, and trade unionists from engaging in political activity, and compelled schoolmasters, university professors, and the senior ranks of the civil and foreign services to take an oath of loyalty to his regime and person. Many of these measures would be reinstated by the series of Nasserist and Ba‘thist regimes that subsequently ruled Syria. Al-Shishakli then appointed a trusted surrogate as president, prime minister, and army chief of staff, while retaining for himself the office of Deputy Chief of Staff of the Syrian Armed Forces. Freed from civilian interference, al-Shishakli retrained, reequipped, and expanded Syria’s armed forces, police, and security services, and executed politically motivated purges of these institutions, as well as the civil service, the judiciary, and most government ministries. In addition, he focused considerable energy on the social and cultural spheres, where his regime’s initiatives displayed an equal measure of statist, secularist, and xenophobic tendencies. As al-Shishakli attributed the influence of religious and ethnic minorities to French Mandate policies of “divide and rule,” he now strictly regulated public speaking by leaders of minority sects, required that Muslims have equal representation on all bodies governing non-Muslim organizations, forbade the use of “foreign” names for places of lodging and entertainment, and mandated that all public events be conducted exclusively in Arabic. In addition, al-Shishakli ordered instructors at the Homs Military Academy to institute a quota system minimizing the number of minorities (i.e., those who were not both Sunni Muslim and Arab) graduating from the institution, and dissolved the Syrian branch of the Muslim Brotherhood. Other decrees targeted practices and privileges long enjoyed by members of all faiths: publicly wearing garments identified with specific religious beliefs and practices was now subject to regulations, and the requirement of religious education was eliminated from the curricula of public schools. Al-Shishakli displayed comparable ambitions in the economic sphere, pursuing classic “import substitution,” corporatist, and infrastructural expansion policies with vigor. His distrust of Syria’s traditional political elites prompted a turn to Damascus’s emergent industrial bourgeoisie. Al-Shishakli enacted protectionist policies and restrictions on organized labor that encouraged these proto-industrialist entrepreneurs to merge their companies into monopolistic enterprises and invest the accumulated capital in constructing factories in newly established industrial zones, thereby making them partners in his efforts to construct an autarkic economic regime. In early 1953, al-Shishakli discarded all lingering pretense by dismissing his appointed “President and Prime Minister” Fawzi Selu. He then promulgated a new constitution, which provided for the direct election of a president wielding executive power over a newly constituted Chamber of Deputies and all other state institutions. On July 10, 1953, in an ominous portent of Syria’s subsequent history, a plebiscite approved the new constitution and “elected” sole candidate Adib al-Shishakli as President of the Syrian Republic by a reported 99% of the vote. Between 1971 and 2000, Hafez al-Assad was repeatedly “elected” president by identical means and with similar margins. The primary agent of al-Shishakli’s authoritarian public culture was the new Syrian Broadcasting Service, which supervised the rapid centralization, expansion, and technological enhancement of radio programming and broadcasting. With this instrument, the dictator initiated the region’s era of media wars, castigating domestic opponents and the rulers of neighboring states during live broadcasts. Equally important was an increase in the number and variety of state-owned periodicals echoing the regime’s narrative. Crucial in this regard were the magazines al-Idha‘a al-Suriyya (Syrian Broadcasting), and Majallat al-Shurta wa al-Amn al-‘Amm (The Journal of the Police and Public Security). Despite the latter journal’s title, it was conceived and marketed as a mass-circulation publication covering news, sports, and entertainment. Yet, most of the journal’s content explicitly conformed to al-Shishakli’s authoritarian program, including regular features exhorting “moral” and “orderly” behavior, celebrating the police and security personnel’s bravery, professionalism, and benevolence, and expressing gratitude for al-Shishakli’s principled and selfless leadership. The earliest issues of The Journal of the Police and Public Security included articles by senior security personnel explaining new measures aimed at the regimentation of social life. One example declared that, in order to prevent “improper behavior not in keeping with Syria’s progress,” new regulations required employees of hotels, restaurants, nightclubs, theaters, and cinemas to register with the police, receive instruction in the craft of identifying “anti-social” types, and wear specially designed uniforms appropriate to their rank and place of employment. Early issues of the journal also featured excerpts from speeches in which al-Shishakli emphasized the essential role of security service personnel in Syria’s survival and development. Yet al-Shishakli was sufficiently sophisticated to comprehend that the knowledge and skills necessary for the professional management of his infrastructure of propaganda and persuasion would not be found in the armed forces or security services. Thus, he turned to those with various forms of modern expertise: academics, technicians, bureaucrats, and most importantly, experienced journalists and polemicists. Another expert expressing such views was Fu’ad al-Shayeb, an experienced journalist, radio correspondent, and government bureaucrat. Al-Shayeb played a crucial early role in raising al-Shishakli’s media profile, persuading the dictator to emulate United States President Franklin Roosevelt’s practice of making evening radio addresses in an intimate, conversational style. In fact, the hiring of journalists as close advisers, the expansion of press and information offices in government ministries, and many of al-Shishakli’s other innovations in the fields of media and public relations closely echoed FDR’s New Deal- and WWII-era efforts. But al-Shishakli’s inner circle included others who were proficient in English and avid followers of American politics and media. The most significant of these figures were Ahmad ‘Isseh, Qadri al-Qal‘aji, and Nazih al-Hakim, who enjoyed unparalleled access to and influence over al-Shishakli. Ahmad ‘Isseh had more than fifteen years’ experience as a journalist, editor, and publisher, including a stint as UPI correspondent in Damascus, when al-Shishakli named him Director General of Syrian Broadcasting in 1953. Qadri al-Qal‘aji had comparable experience as a journalist, editor, and publisher in Syria, Egypt, and Lebanon. In 1952, he became the director of al-Shishakli’s press office, and subsequently as his Private Secretary. Attorney and former press officer of the Syrian diplomatic service Nazih al-Hakim served as the dictator’s public relations adviser. When al-Shishakli decided to assume the presidency, al-Hakim supervised a media campaign that included placing massive posters bearing the leader’s image in public places and distributing untold numbers of similar photographs to schools, government offices, mosques, and businesses, an obvious harbinger of the Assad regime’s more comprehensive efforts two decades later. Finally, during the period of al-Shishakli’s first three coups, he received the advice of yet another practitioner of “engineering” public opinion a la Madison Avenue, CIA agent Miles Copeland. Stationed in Damascus from 1947 to 1950, Copeland immediately cultivated a close relationship with al-Shishakli. In this and in subsequent assignments, Copeland gradually refined his professional specialization, employing the tools of advertising, public relations, management consulting, and psychological warfare to promote and sustain leaders perceived as “pro-American,” i.e., anti-communist. As he prepared to assume the presidency, al-Shishakli announced the formation of the Arab Liberation Movement, the institutional expression of his vision for a corporatist, single party, and authoritarian state. Employing quasi-fascist rituals, ALM rallies engendered countless radio broadcasts, journal and newspaper articles, photographs, and newsreels. For example, the Journal of the Police and Public Security described a June 1953 rally in Damascus as a “glorious festival” at which al-Shishakli’s arrival prompted “the applause of hundreds of thousands” who had “flocked to the capital from all corners of the country,” and whose “throats echoed chants about the deeds of Syria’s national hero and savior who gave them lives of freedom and happiness.”[i] A portion of al-Shishakli’s speech was repeated by the crowd, swearing “allegiance to the leader,” “his principles,” and “his Arabist goals.”[ii] Media accounts of these orchestrated events, which asserted the voluntary participation of Syrians from all walks of life, clearly foreshadowed those produced on a grander scale after Hafez al-Assad’s seizure of power. Similarly, the inaugural issue of The Journal of the Police and Public Security featured Director General of Police and Public Security Ibrahim al-Husseini’s offering of thanks to God, the apostles, and the prophets for the divine favor bestowed upon Syria as it was guided “into its blessed renaissance” by the “leader-hero…bearing a torch to light the way.”[iv] By alluding to the ALM’s symbol—a flaming torch held aloft—al-Husseini was deploying a principal metaphor in the leader cult’s discourse. The torch and the leader’s “voice” were symbols of agency, employed throughout this discourse to portray al-Shishakli’s leadership as the force endowing the people of Syria and the Arab world with the capacity to see and speak amidst the gloom and silence produced by foreign oppression. In the same issue, Hind al-Qawwas, a prominent member of the ALM, contributed a lengthy and adulatory assessment of al-Shishakli’s live radio broadcast explaining the major provisions of his draft constitution. According to al-Qawwas, the document would “restore” women’s “usurped rights” and eliminate “forms of repression” that had “inscribed shame upon the brow” of Syria. Yet the most hyperbolic expression of al-Shishakli’s cult was provided by Qadri al-Qal‘aji, whose paean—“Luminous Pages from the Life of a Leader”—was accompanied by a caricature of al-Shishakli as the Statue of Liberty. [vii] This neat confluence of the ALM’s logo—the flaming torch—and the cult’s frequent, uncritical embrace of the visual language of American exceptionalism verges on kitsch. In this respect, the “aesthetics” of al-Shishakli’s cult once again foreshadowed the patent absurdity of the Hafez al-Assad and Saddam Hussein cults. 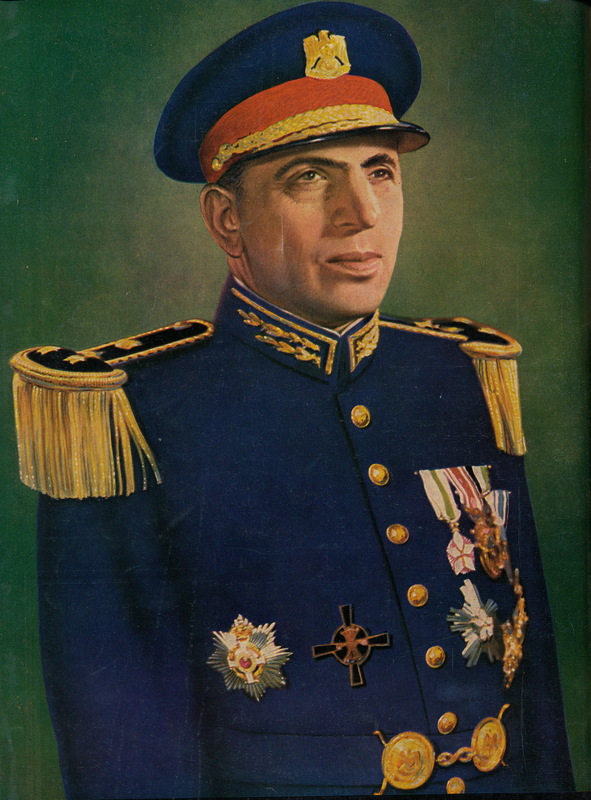 In February 1954, an army rebellion led by many of the young officers al-Shishakli had favored with promotion compelled the dictator to flee Syria. These officers, in cooperation with prominent members of the old political elite, rapidly abrogated critical elements of al-Shsihakli’s governing system. Within days of al-Shishakli’s departure, most of his senior government appointees and his close advisers and associates were dismissed from office, and many accompanied the dictator into exile. In fact, other than the glaring absence of al-Shishakli, the journal’s content displayed no discernable change. The same sports, entertainment, and Police Gazette-style crime features continued to appear, as did pictorials commemorating the sacrifice of police and security service personnel and warnings about the ever-present threat of Zionism and other sinister, “alien” forces. In fact, in this and other venues, the use of Madison Avenue-style techniques to stimulate anxiety, deployed so ably by al-Shishakli’s team of media experts, continued unabated. Furthermore, a flaming torch, the symbol of al-Shishakli’s Arab Liberation Movement, and a constant feature of his regime’s iconography and discourse, was now adopted as the journal’s logo. This symbolic appropriation, along with the Orwellian choice of title to designate a journal published by the security services, signifies the ironic nature of Adib al-Shishakli’s legacy: Syria, long deprived of the capacity to “speak” in international affairs, would now be “heard” through the pronouncements of its Public Security Police. And despite Syria’s immediate nominal return to the status quo ante al-Shishakli, the dictator’s regime had wrought seemingly irreversible changes in the country’s political culture. The armed forces and security services refused to relinquish their influence on successive governments. And the army’s experience of executing al-Shishakli’s coups, enabling his dictatorship, and then overthrowing him in collusion with his enemies, transformed the institution into an inherently political entity that would, largely through its own internecine conflicts, perpetuate and exacerbate Syria’s instability over the following decade. After a failed attempt (with U.S. assistance) to return to power in 1957, Adib al-Shishakli receded into obscurity in Brazil, where he was assassinated in September 1964. Yet, the most distinctive element of al-Shishakli’s system, the leader cult, would linger in official memory, only to reappear in grotesquely exaggerated form decades later. Kevin W. Martin is Willis F. Doney Member in the School of Historical Studies. He is exploring the reach of American “soft power” by analyzing Syrians’ exposure to and perceptions of public diplomacy, propaganda, films, advertising, and new modes of urban leisure. Drawing upon an array of Syrian and American sources, he is also analyzing cold war cultural exchange. [i] Majallat al-Shurta wa al-Amn al-‘Amm 7 (July 1953), 2. [ii] Majallat al-Shurta wa al-Amn al-‘Amm 7 (July 1953), 3. [iii] Al-Idha‘a al-Suriyya 1 (September 1, 1953) pp. 6-7, 27. [iv] Majallat al-Shurta wa al-Amn al-‘Amm 1 (January 1953), 1. [v] Majallat al-Shurta wa al-Amn al-‘Amm 7 (July 1953), 1. [vi] Majallat al-Shurta wa al-Amn al-‘Amm 7 (July 1953), 20, 24. [vii] Majallat al-Shurta wa al-Amn al-‘Amm 7 (July 1953), 10-11. [viii] Sawt Suriya 16 (April 1954), 2.